Halloween Candy Shop info about the game-Games2Rule. It�s Halloween festival season! You have renovated the candy shop to attract Halloween-costumed kids with the seasonal candies. 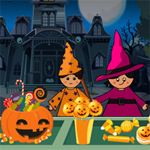 Earn money by serving the candies according to kids wish.